Okay. According to Goodreads, I read Pure (Julianna Baggott), Iterate and Optimize (Sean Platt and Johnny B. Truant), Fifth Business (Robertson Davies), Landline (Rainbow Rowell), and Against Her Rules (Victoria Barbour). If you want to check out my reviews/ratings on those books, here’s the link to my Goodreads shelf. Fifth Business was the high point of my reading last month. I read it in high school, and my teacher somehow managed to not ruin it while we were dissecting it. If I were taking a critical view I could find things to complain about, but I’m not. These days I’m sick of this reading slump and am desperate to enjoy books, so I don’t question it when I do. It’s a fascinating book. It’s funny that I say I don’t enjoy “Literature” and Can-Lit all that much, but some of my all-time favourite books fall into that genre. I guess I’m picky about it. I don’t care for self-importance or pretentious writing in books. When I find an amazing story without those flaws, though, I’ll enjoy it no matter what genre it makes its home in. …we went to St. John’s, which meant that I got to go to Chapters. It’s four+ hours from my house, but is actually the closest proper bookstore I’ve got, so going is always exciting. That’s not to say I bought all of these new, though. I am on an author’s paycheque here, guys. I also hit Value Village and got lucky, so the balance here is 9 new and 8 used. I’m particular about what books I’ll buy used, at least when I can afford to be. I try to only buy used when I wouldn’t ever buy the book new, so I know the author isn’t missing out on a sale. I buy used when I’m at least half-sure based on reviews or my own experience that I won’t enjoy them and probably won’t finish, but want to give them a fair shot anyway (the Mortal Instruments books and Hush, Hush), have heard of the book but am not curious to snap it up (All the Bright Things), if I’ve read and enjoyed the book but for some reason don’t want to buy new (I enjoyed Matched, but was really disappointed with the sequel, so it’s not a series I’m invested enough in to buy new for my shelf), or books that I’ve lost or worn out old copies of (The Shipping News). And antique books, of course. Can’t really buy those new. And if I do enjoy those books I’m iffy on, I’ll either grab new copies or leave good reviews to thank the author. One of those “do unto others” situations, I guess. Money’s not the only way readers can help us out, though purchases are always appreciated! As for the new books, Throne of Glass is one of my favourite YA Fantasy books. I didn’t adore Crown of Midnight, but part of that might have been the fact that I caved and bought the massive, uncomfortable hardcover before the paperback came out*, so I bought that and whatever else of the series I could find in paperback. Hard as Ice is book two in the Heart’s Ease series. I really enjoyed Against Her Rules in spite of it being very much a SERIOUSLY GUYS ROMANCE NOVEL (the Newfoundland setting and competent writing really helped there), which I’d picked up at the library. Promise of Shadows and The Girl Who Circumnavigated blah blah blah (sorry, I can’t even remember the title long enough to type it out after I scroll down) were $5.99 bargain books that looked interesting, so I grabbed them. The Sandman was a gift from my graphic novel-loving husband who was terribly excited to hear that I wanted to start the series, the drawing book is a project for me and one of the kids to work on together, and You Are A Badass was… well, I want to understand my own badassness, man. I’m getting there. And I’ve actually finished and reviewed that one on Goodreads, but that’ll fall under April here. My next book haul will be less exciting. I’m doing a “no spend” month, or as close to it as I can. I have a signed paperback of an upcoming release ordered, and if a certain Kickstarter campaign gets funded, I’m on the hook there. But we can still chat about reading and stuff. TELL ME: What did you read last month? 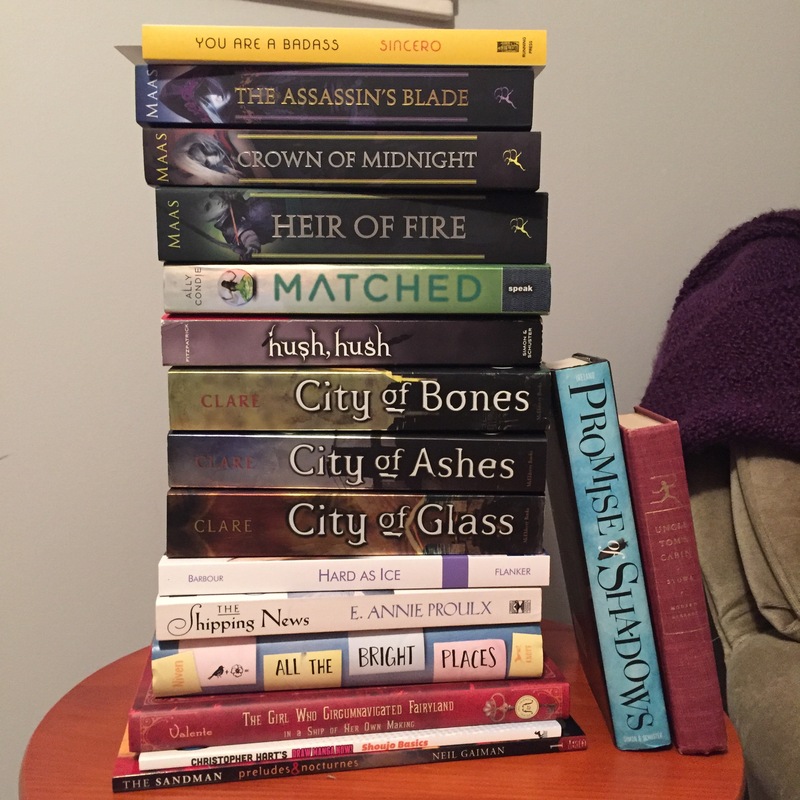 Are you a fan of anything in my book haul pic? No spoilers, please! *I’m resisting the urge to rant AGAIN against publishers who do that. I hate it. So much. Just let us choose what format we want on release day. Thanks. Fantastic insight into the building of an amazing Fantasy world. I absolutely fell in love with Damsport and its inhabitabts when I read The Viper and the Urchin (now titled The Bloodless Assassin, which is really fitting). It’s one of those books that deserves WAY more hype than it gets. Read this post, then check it out! Book two is out April 9. Very excitingly, The Black Orchid, book 2 in the Rory and Longinus saga, is now available to pre-order. To celebrate, I thought I’d let you take a peek behind the curtain of Damsport’s creation. I’ve been interviewing authors about their research for a little while but I have yet to put myself under the microscope, as it were. Now I won’t interview myself because that’s just too meta, but I thought I’d share the inspirations that went into creating Damsport.